We carry a range or products to allow us to select the best product for your particular situation – we certainly don’t push one particular product. We only use products registered by the government (APVMA) that have been classified as safe to use in residential and commercial areas, around children and pets. Some of the main products & equipment we use are listed below. If you wish to know more about the products that will be used at your property, our technicians are happy to discuss the options prior to any treatment. We also issue a pest treatment advice (information on the treatment) after the service, as required by law. If you wish to get a copy of the MSDS (material safety data sheet) for any product we use, please let us know. The leading termite product on the market with long lasting performance. Altriset is the newest liquid termite treatment on the market and has a unique “stop feeding” effect and great environmental profile. 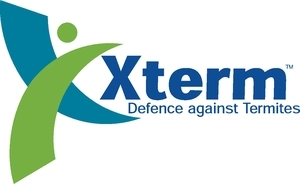 Xterm termite monitoring and baiting system is the latest termite baiting system on the market. One of vital termite detection tools to aid in picking up areas of moisture and termite activity in walls.